it doesn’t matter how much you plan it out, thanksgiving day is always a whirlwind! some recipes you can make in advance, some things you can set up the day before, but one thing you will always have to do is entertain kids while you try to get everything ready for dinner and guests! it’s one of those challenges that all parents have on any given day – to try to get dinner on the table whilst juggling kids – but on thanksgiving day, there is just that much more to do and with bored/tired/hungry little kids underfoot it can be a little overwhelming. in the past i’ve given my kids these free printable thanksgiving activities to do and they have loved them! 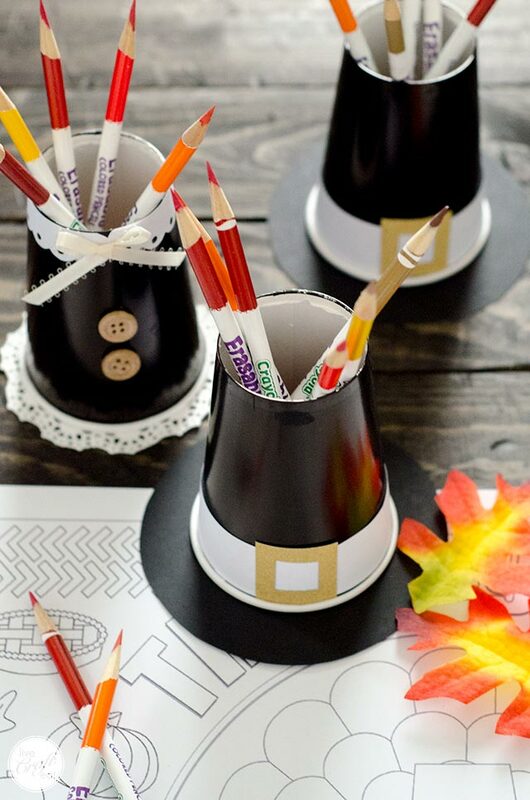 this year i’m attempting to give myself even more time to accomplish everything, so i’ve made some fun printable thanksgiving placemats with games, coloring pictures, etc, and what could go more perfectly with those than some colored pencil/crayon holders in pilgrim style? we’ve got both boys and girls coming for thanksgiving this year, so we’ve made pilgrim hats for the boys, and pilgrim-style dresses for the girls. that are both super cute, and i love how they turned out! black cardstock or construction paper. this is going to be used on the bottom of the pilgrim hats both decoratively for the brim of the hat, but also as the base. i used cardstock because it’s a heavier weight and will hold the colored pencils or crayons better if you need to pick up the cup with those in it. gold paper. if you don’t have gold paper, you could always use yellow cardstock. white/offwhite ribbon. i was going to use red twine, as pictured below, but changed my mind last minute, and i think write/offwhite ribbon was definitely the way to go. i’ve seen this ribbon go on sale for really cheap at craft stores. you can see it pictured in the actual process photos. mini hole punch. (aff link.) i love this little hold punch! i always use it to attach labels or tags onto gifts. for this project, we need it to punch the holes on the “lace” we’ll be making out of white paper. glue. (aff link.) to keep everything in its place. wooden buttons. (aff link.) for the pilgrim dress. 4″ paper lace doilies. (aff link.) for the bottom/base of the pilgrim dress cup. 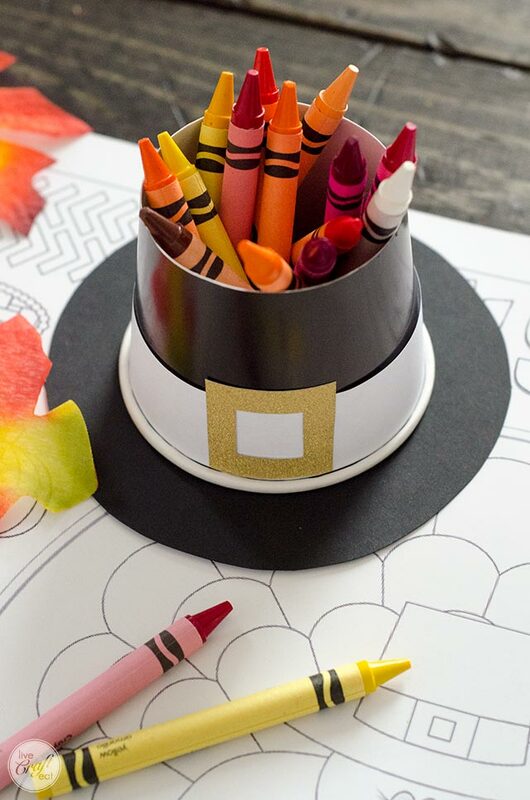 you’ll also need to print out this free printable pilgrim hat and dress crayon cup template. 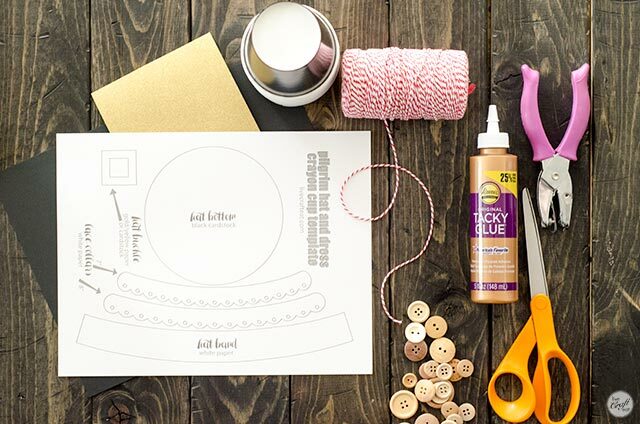 for the pilgrim dress, the lace that goes at the top for the collar is right on the template – just print out a copy on plain white printer paper for each pilgrim dress you need to make. for the rest of the template, you can just print it out once onto white cardstock. okay, now that we’ve got the supplies and template established, here comes the fun part! the first thing you need to do it cut off the bottom of the cups. i think the easiest way to do this is carefully, with an exacto knife, just keeping it flush with the sides of the paper cup. next, you’ll need to add the lace collar (from the printable template) on the dresses, and the white paper band for the bottom of the hats. both of these should be made with white printer paper. just add a dab of glue to keep them in place. ***note: for the lace collars, there are 2 different sizes. 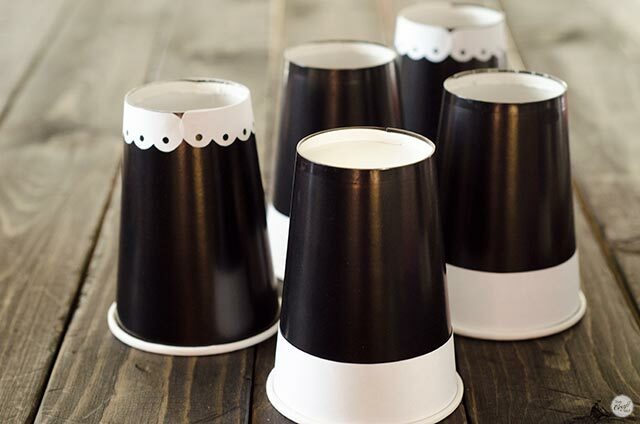 if you’re going to put it around the base of a normal paper cup like pictured below, you will use the shorter 7″ lace template. 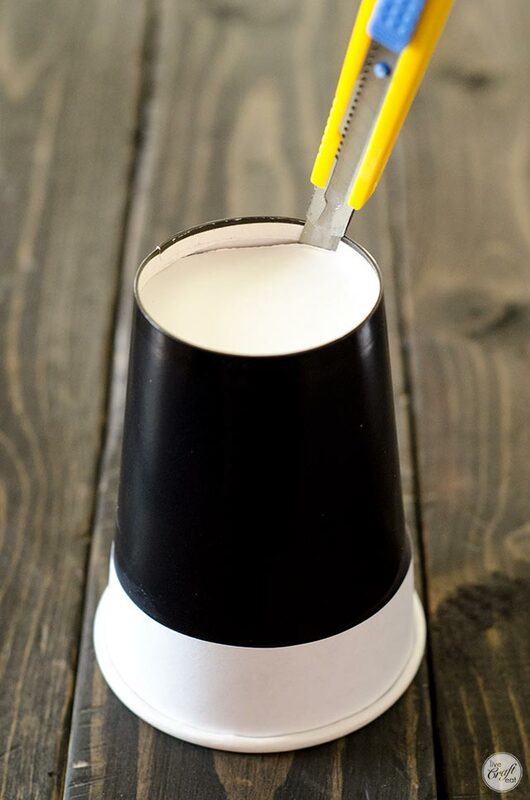 the 8″ template is for making a shorter crayon cup holder, which i will explain later in the tutorial. 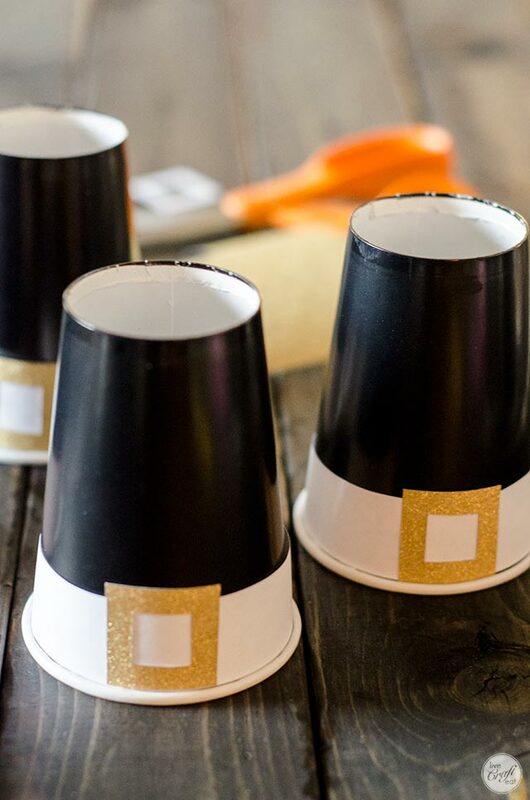 for the pilgrim hats, cut buckles out of gold paper and glue them onto the white band. and for the pilgrim dresses, tie a bow out of white or offwhite ribbon and glue it where the lace collar comes together. glue on a couple of wooden buttons in the center. you could cut the cup down to size. i tried it by cutting mine down to 2.5″ tall, just to see how it would work. the crayons fit perfectly in there. 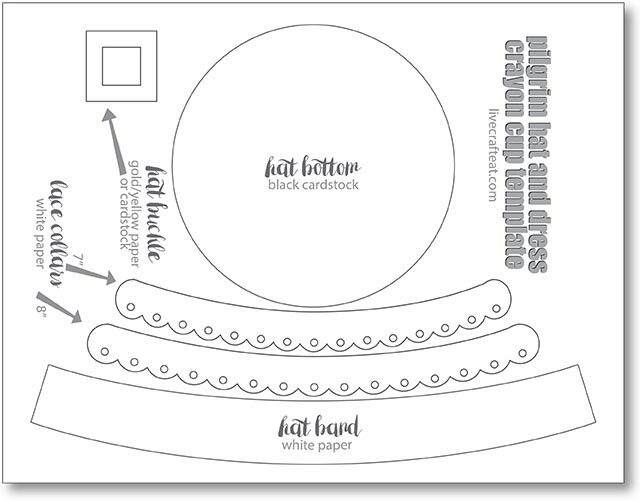 the second lace template on the printable, which is 8″ long is for if you decide to trim your cup down to a 2.5″ size. 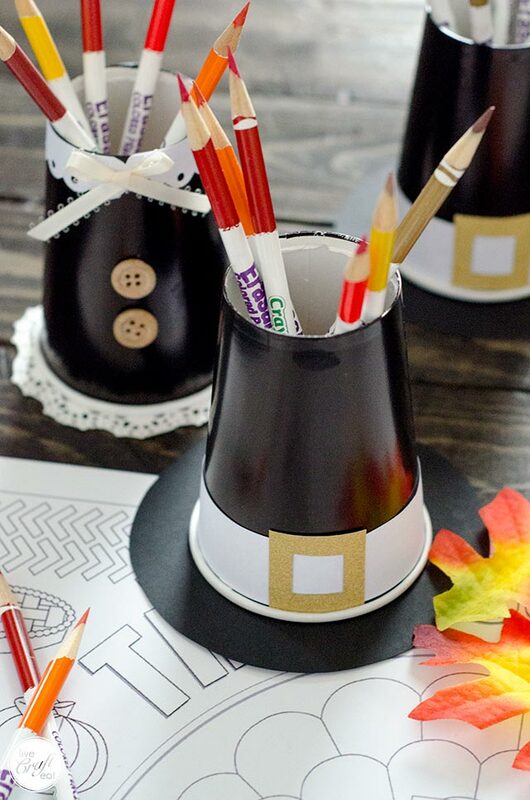 now all you need to do is glue the cups onto their bases – a black cardstock circle for the pilgrim hat, and a 4″ paper lace doily for the pilgrim dress. ok, those hats are cute, but that dress has me all heart-eyed! these are going to look so great on the kids’ table this thanksgiving! if you liked this post, please feel free to pin the image below (or any image from this post!). we sure do appreciate your social shares! Wow – Thanksgiving at your house will be awesome for everyone except the turkey!